LeeAnne Thompson received the Doctorate of Musical Arts Degree from University of North Texas in 2008 with Terri Sundberg. She is the principal flute of the Las Colinas Symphony Orchestra and an active freelance musician and pedagogue in the Dallas-Ft Worth metroplex. Prior to this position, Ms. Thompson was an adjunct faculty member at Southeastern Oklahoma State University. Ms. Thompson was the winner of the Upper Midwest Flute Competition and a finalist in the Frank Bowen Competition, Mid-South Flute Competition and Summerhays Competition. She has also performed as a soloist in the United States, Canada and Mexico. As a teaching fellow at UNT, Ms. Thompson taught flute lessons and was involved in the Music and Medicine program working with Dr. Kris Chesky. 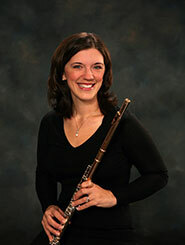 Her music and medicine research focused on risk factors for flute related pain among high school and college students. Results of her dissertation research showed that strength, flexibility, and exposure are risk factors for flute related pain. Thompson, LeeAnne. Risk Factors for Flute-Related Pain among High School and College Students. Denton, Texas. UNT Digital Library. http://digital.library.unt.edu/ark:/67531/metadc6044/.